A new gourmand floral feminine fragrance by Yves Saint Laurent. 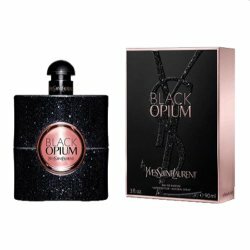 With notes of pink pepper, orange blossom, black coffee and vanilla.<br /><br />A subtle fruity fragrance that dries down to a combination of spices.<br /><br />Black Opium was announced as a Rock & Roll interpretation of the classic that should highlight the dark mysterious side of the YSL brand with a shot of adrenaline.<br /><br />The first coffee floral Black Opium, a unique composition where the electrifying energy of black coffee meets the assertive femininity of white flowers in a vibrant, sensual and addictive contrast of light and dark. A new gourmand floral feminine fragrance by Yves Saint Laurent. With notes of pink pepper, orange blossom, black coffee and vanilla. A subtle fruity fragrance that dries down to a combination of spices. Black Opium was announced as a Rock & Roll interpretation of the classic that should highlight the dark mysterious side of the YSL brand with a shot of adrenaline. The first coffee floral Black Opium, a unique composition where the electrifying energy of black coffee meets the assertive femininity of white flowers in a vibrant, sensual and addictive contrast of light and dark.